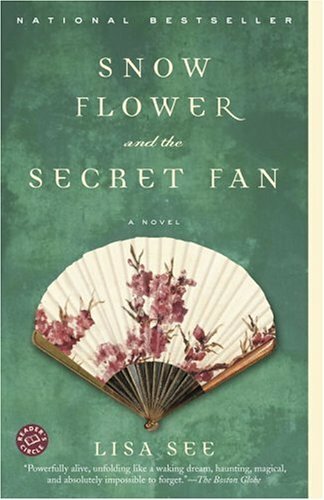 Lily and her laotong, Snow Flower, begin their relationship at this young age, and throughout Snow Flower and the Secret Fan , Lisa See shows us how their lives intertwine and diverge over the years. This is more than just a story of friendship, though. What Lisa See presents is a clear picture of the culture of the time. The traditions explored in this book are both fascinating and disturbing; the chapter on footbinding is particularly painful. I learned a great deal about 19th century China, and I am certainly glad I didn't grow up in that time and place ~ especially as a woman. I've had this book on my shelf for some time now, and have continuously heard from people who loved it. I did enjoy it. It was interesting, engaging and enlightening. I'm just not as excited by it as I thought I would be. And perhaps that's because it was as good as I expected it to be based on the comments I've received from others. I think I would have enjoyed it even more if I hadn't heard so many good things about it first. This review was written based on a copy of Snow Flower and the Secret Fan that I received from PaperbackSwap.com. Sometimes I wonder if we expect too much when we read such great reviews. I liked it because I thought it was so informative of something (foot binding) I didn't know anything about. It was such a different culture!! I have heard great things about this book. Thanks for the review!